Happy Holidays! Whatever is beautiful . . . Whatever is meaningful . . .Whatever brings you happiness, joy, and love . . . May it be yours this holiday season and throughout the coming new year. Loving Peace to you and yours. The North Pole’s wind howled out a song, outside a workshop where elves belonged. Small hands gathered in a frenzy of work, hammering and painting like well-groomed clerks. Dwarf feet scurrying ‘round a sawdust floor, collecting wares in hopes to make more. Some pursed their lips, checking at lists; some hummed a tune all the afternoon, for busy were they, at their tasks each day—for soon would be here, Christmas joy and cheer! With a hop and a step, one elf stopped his pep. His ears perked up, like an overly eager pup. His face tightened, as if frightened. His eyes combed the floor COMMANDING, “Silence!” of each and every chore. The silence still drumming. . . . Nothing moved . . . but their eyes . . . to a large wooden door. They heard a scurrying on the other side floor. The door swung open with a glee, and a big jolly man filled it up times three! With his red and his white, Santa’s eyes dancing to the sight, came Bigelow into the door’s light. “How are things coming, my friend?” Santa gestured with one hand. With a turn of his head, Bigelow eyed them with dread: Me, Myself , and I, they’d be. But, tomorrow night only ONE would be—the best of the three! One with promise, one with talent, one with a gift--the one most gallant. Then, honored he’d be as a Lifelong Elf, given the gift of a name for himself. The task was hard, Bigelow knew—giving joy and love one’s whole life through. “Thee lot is of little promise,” he whispered to himself, gazing harder into the face of each elf. They sweated through the night with fury and might, till the candles burned low and their pace snailed slow. Then Bigelow called for the other elves to go. Breakfast and naps were needed so. Me, Myself , and I waited for his word. Their hardest task was now to be heard. Bigelow pulled up high on his belt, puffing out his chest, with all the importance he felt. With a sweep ‘cross the floor . . . Bigelow opened . . . then closed the door. I stood alone, not knowing where to begin. He whimpered and wailed at the sight of his friend. He complained all the time as the clock ticked by. Could he do it alone? Why he never even tried! Myself to the window with a step found him, gazing through the glass at the frost covered trim. The others away, to his mind he did go, till the first star’s light on the pane did glow. His heart swelled as an image came clear, his face reflected the eyes of the One so dear. Onto the floor went his hands, knees and more, seeking the pieces to complete his chore. Till up he came with a small piece of pane—to the others he ran to show and exclaim! But Me could not see for so busy was he. And I with a frown could not look at the found, with all his wailing, he heard not a sound. Then midnight stuck for all three! In came the man and jolly was he with Bigelow there both waiting to see . . .
Me held a box, carved the loveliest ever seen, to hold precious gifts the children would glean. I stepped up beside, hands shoved away to hide, gave nothing by the fear of the deed. Myself was last, with the pane in his grasp. He held it up high catching the light of the star lit sky—a gift for free—the reflection of all three! The man with the belly shook like jelly, laughing and choking with glee. There in the light was the beautiful sight, of the grandest gift of this night. The elf got his name of Windowpane, for all to remember each offered the same: a window of light reflected in our sight. For if ye be Me—too busy to see, or if ye be I—too fearful inside, ye can still find Myself—a light of wealth. For in the light, we are but one Elf. Our gifts are inside, where no wrappings can hide. Ho … Ho … Ho … A Season of Love & Joy to you all! Thanksgiving Day: Word Keepers Inc.
Thanksgiving Day is my holiday of choice, because I get to bake, talk with family and friends, and saturate myself in observing patterns I call the divine presence of Spirit connecting the dots of our souls. It’s not how it all comes together on Thanksgiving Day, but that the Day brings us together. Estranged family members might show up after years of absences; lost good friends might circle back around unexpectedly accepting a dinner invitation; or a stranger might take the full dinner plate you offer up at a shelter and you simply smile and offer a kind word. I think of Thanksgiving as a homeopathic holiday—friends and family show up with all kinds of issues and agendas (we’ll call them dis-eases for the sake of this analogy), but something allows a softening in them and in us on this Day; we soften enough to experience real love for each other—I liken this to a “like heals like” Thanksgiving Day. To me, this is the real food we give thanks for on this Day—sharing our lives with others. One of my attributes as a writer is my ability to see patterns. It is this pattern, this “like healing like” scenario of unlikely characters meeting at a crossroads on a particular day, stepping onto the path of their pilgrimage, their journey, that I’d like to offer up as the divine presence of Spirit connecting the dots between Donna, Danny, and me; the characters in The Way; and Martin Sheen and Emilio Estevez and me. Last September I was invited by Donna Visocky (BellaSpark Magazine) to a private screening of The Way. Ironically, Danny Long, who I’d introduced to Donna at a book launching party, was also invited to write a review of the film for her magazine. So here’s how this film and the viewing of it, connected some very powerful healing dots. The characters in the film end up walking the Camino de Santiago together. In route they discover that each of them has experienced some personal loss. While Donna, Danny, and I were watching The Way, I did not, nor do I think they knew that each of us has our own history of loss. Donna lost her daughter in a car accident several years ago. Danny lost his uncle, my best friend’s brother, the same year I lost my first husband. Like the characters in The Way, we are all connected by our humanity and our spirituality along our life’s journey of Self-discovery. All of us are travelers on our own pilgrimage: bringing understanding, meaning, love, wholeness, and purpose to our journey. Awareness helps us ‘connect the dots’ to better navigate the events of our lives on this journey, but we may not always be privy to that awareness. We might be sleepwalking through our lives, like the main character, Tom Avery, played by Martin Sheen, until Spirit intercedes and helps us connect the dots. Tom Avery gets a wake-up call about his own life with the loss of his son, who dies the first day out on the road to Santiago. These are the themes of the film, The Way. After the private screening, which I loved, Martin Sheen and Emilio Estevez were present for a Q & A with the audience. I knew this ahead of time so I brought two scallop shells (symbols of the Camino de Santiago and proof that a pilgrim had finished the pilgrimage) for each of them as a thank you gift for the private screening. I also handed Martin Sheen my ‘television bible’ of Hidden Portraits. This ‘television bible’ took me 23 years to write. It’s my story of losing a spouse at the young age of 35 and finding my way back from guilt and grief into celebrating the gift of my life again. Martin Sheen would not know that the act of handing that piece of writing over to him was “My Way” of proving I’d finished the pilgrimage of this life event. Again, loss and recovery are significant universal themes in this film. Martin Sheen and Emilio Estevez were so fully present, grand, gracious, and enthusiastic during the Q and A. They talked about Hollywood needing more films like The Way—films that honor our human journey. I agree. 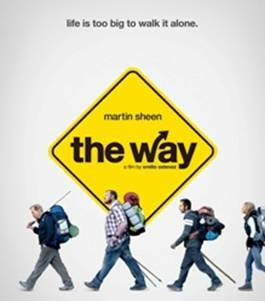 So, if you have the opportunity during the upcoming holidays, I’d highly recommend seeing The Way. Take a friend or two or family members or a complete stranger. You might be surprised at what dots get connected in the simple act of watching a film together. Danny Long’s excellent review of the film is offered below. 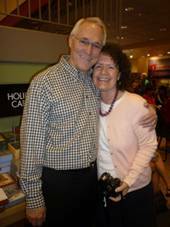 Blessings to you this Thanksgiving Day and throughout the holiday season from Toni and George. Imaginary lines are powerful things. They tell us who we are, where we belong, whom to befriend. They tell us where to go, what to do, how to act. We don’t see them, but we know they’re there, and we feel their sway. This is because these imaginary lines, according to John Pickles, professor of geography and international studies at the University of North Carolina, reside deep down within the bedrock of modern civilization. “The world,” he says in A History of Spaces, “has literally been made, domesticated and ordered by drawing lines, distinctions, taxonomies and hierarchies.” Draw a line — on a map, in the sand, in your mind — and separation automatically ensues. You’re either in or out, here or there, on this side or that. These divisions consequently construct our sense of reality. We come to accept them uncritically. “I’m American,” one says; another, “I’m Dutch.” “I’m Canadian,” one proclaims; still another, “I’m Irish.” And the longer we accept them the more natural they appear and the more difficult they are to overcome. But difficult or not, that’s precisely what writer/actor/director Emilio Estevez sets out to accomplish in his latest movie, The Way, which is about walking the Camino de Santiago. This thousand-year-old pilgrimage route starts in France, stretches across northern Spain, and ends at the Cathedral of St. James in Santiago de Compostela, the supposed resting place of St. James’s remains. It’s important to note, however, that Estevez does not dismiss categorization entirely; he’s wise enough to acknowledge how deeply the lines of separation have been etched into humanity’s subconscious. Instead, Estevez uses the road to Santiago — itself a line of sorts — to cut through these categories and bring people together from across the globe. In the movie, Tom Avery, played by Martin Sheen, learns that his only child, Daniel (Estevez, Sheen’s son), has died in the Pyrenees on his first day walking the Camino (Spanish for “the way”). He travels to France to retrieve Daniel’s body and while there decides to cremate it and walk the Camino himself, scattering the ashes as he goes. The thing is, Tom — grumpy, gray, withdrawn — isn’t your average peregrino. He certainly doesn’t approve of his son’s decision to make the journey, deeming it an escape from the pressures of real life, a deferral of adulthood. “You know,” he tells Daniel in one of the movie’s many flashbacks, “most people don’t have the luxury of just picking up and leaving it all behind.” So when he decides to follow in his son’s footsteps, it comes as something of a surprise — and a pleasure. Tom learns that walking the Camino is anything but a luxury. The road to Santiago is hard, emotionally and physically. Pilgrims walk an average of twelve to fifteen miles a day, weighed down by large backpacks and the skeletons in their closets — bad habits, fractured relationships, personal tragedies. Indeed, as Captain Henri (Tchéky Kario), the man who informs Tom of his son’s death, says, “The way is a very personal journey.” No two pilgrims experience it in exactly the same way and Tom proves to be no exception. The once solitary curmudgeon slowly lets his guard down and finds the joy of fellowship by befriending three other pilgrims who become his constant companions — his new family, as it were: a Dutchmen named Joost (Yorick Van Wageningan), a Canadian named Sarah (Deborah Kara Unger), and an Irishman named Jack (James Nesbitt). Fellowship is, to be sure, part of the Camino’s character. Millions of peregrinos, from the Middle Ages to the Age of Information, from all continents and all denominations, have trekked the 800 kilometers to Spain’s western coast. And as those who have made the pilgrimage will tell you, one of its most unforgettable experiences is the simple yet extraordinary realization that the ground beneath your feet has touched the feet of generations of pilgrims before you and will touch the feet of generations of pilgrims after. In the end, such realizations as this are what The Way is all about. It’s about becoming aware of the divisions to which we have so long subscribed — divisions of time, place, nationality; it’s about understanding that these divisions aren’t natural but created; and it’s about recognizing that we’re the ones who have created them. But it also teaches us that we can uncreate these divisions and, by doing so, perceive the world anew. After all, that’s what happens to Tom. As he walks the Camino he finally sees Daniel, really sees his venturesome pilgrim son, curious and courageous, no longer here but in the hereafter, marching alongside him, raising a glass at dinner and swinging the incense in the Cathedral. There are greater things in life than obeying imaginary lines, Tom discovers. We just have to be willing to find them and to let them find us. Know The Way to the Library? A lot has been written about the Camino de Santiago, which is an indication of how influential pilgrims of the past have found it. Below is just some of this written work. While this list is by no means exhaustive, it will get you started on your way. Buen Camino! Aviva, Elyn. Following the Milky Way: A Pilgrimage on the Camino de Santiago. Ames: Iowa State University Press, 1989. Brierly, John. A Pilgrim’s Guide to the Camino de Santiago: The Way of St. James. 5th ed. Forres, Scotland: Findhorn Press, 2009. Coelho, Paulo. The Pilgrimage: A Contemporary Quest for Ancient Wisdom. New York: Harper Perennial, 1998. Frey, Nancy Louise. Pilgrim Stories: On and off the Road to Santiago. Berkeley: University of California Press, 1998. MacLaine, Shirley. The Camino: A Journey of the Spirit. New York: Simon and Schuster, Inc., 2000. Melczer, William. The Pilgrim’s Guide to Santiago de Compostela: First English Translation, with Introduction, Commentaries, and Notes. New York: Italica Press, 1993. A translation of Book V of the Codex Calixtinus, the earliest known guidebook to the Camino de Santiago, written in the twelfth century. Mullen, Robert. Call of the Camino: Myths, Legends, and Pilgrim Stories on the Way to Santiago de Compostela. Forres, Scotland: Findhorn Press, 2010. A customer [writers/authors/readers] is the most important visitor on our premises. He is not dependent on us. We are dependent on him. He is not an interruption of our work. He is the purpose of it. He is not an outsider to our business. He is part of it. We are not doing him a favour by serving him. He is doing us a favour by giving us an opportunity to do so.